It’s a little over a year since I published my first post … wasn’t WordPress supposed to send me some sort of YeeHaw about that? Whatever – the point is, I’m kinda back where I started: in the veggie garden. I gave up on it in July when the weeds swallowed my wheelbarrow, but that was a tactical retreat, not an admission of defeat. His complaints are clearly nonsensical, since it’s obvious that he’s having a blast. Here, he’s making a big spread-out pile of horse manure, dirt and stable waste into a compact, tall pile, while seated on two very big round things. Every man’s dream, right? This spring Himself and I have gone in with a unified front and guns blazing. We have experienced some friendly fire (mainly when Himself accuses me of constantly dreaming up projects that are, and I quote, “too damn big”, and then, and I quote further, of “expecting him to do all the damn work”), but no one is actually dead. Yet. I had to concede some key arguments in order to get him on board … but to be honest, while my ideals are good, they were more than I could accomplish given how unfit I am. I really wanted this garden to be established using a permaculture and no-till approach from the outset, but it simply wasn’t practical. The area we’ve set aside for fruit and veggies (with a corner lopped out of it for the chickens) is pretty big – around 100×80 ft – and it was hillocky and rutted and impossible, especially since I’m hobbling about on a fractured ankle. So I lifted the tractor ban, and the ground is now depressingly compacted, but flat and smooth. As we fill it up with raised beds and plants it will become inaccessible to the tractor, and I’m hopeful that, given time and plenty of tasty composted goodies, the earthworms and other tiny critters will heal the soil. Himself has had a few concessions to make as well. Being an engineer with (gawd help us) a military school background, he likes things neat, matching, with square corners. Do you have any idea what it would cost to fill 8,000 sq,ft with beautifully crafted raised beds like these? Nor do I, and although he could probably calculate it with ease, it makes no difference: however you add it up, the answer amounts to “a shitload”. What’s left of the pole pile after yesterday’s work party, with Argos doing a “stay” to help make the picture pretty. The start of our raised bed garden. To the left, bordering the Nasty Neighbor, is a bed I built a few weeks ago, using old power poles. It contains an 80-ft row of asparagus. 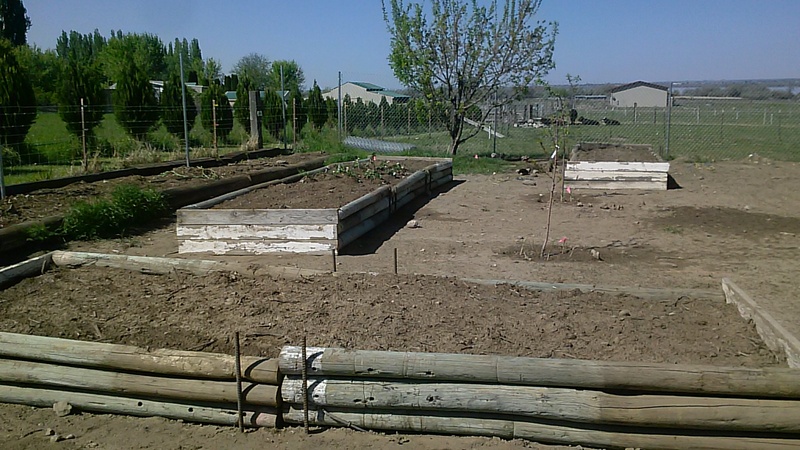 The three raised beds are what we built on Saturday. The Engineer says this looks, and I quote, “scruffy”. I think it looks rustic, and will be charming when full of greenly growing goodness. If you’re wondering how to build raised beds using somewhat uneven old poles, the way we did it was to lay the bottom ones out. (The poles are used only for the long sides of the bed.) We then hammered sections of rebar into the ground to hold them in place. (In the final step, the rebar needs to be hammered right down such that it doesn’t stick up above the level of the top pole and stab unwary gardeners.) 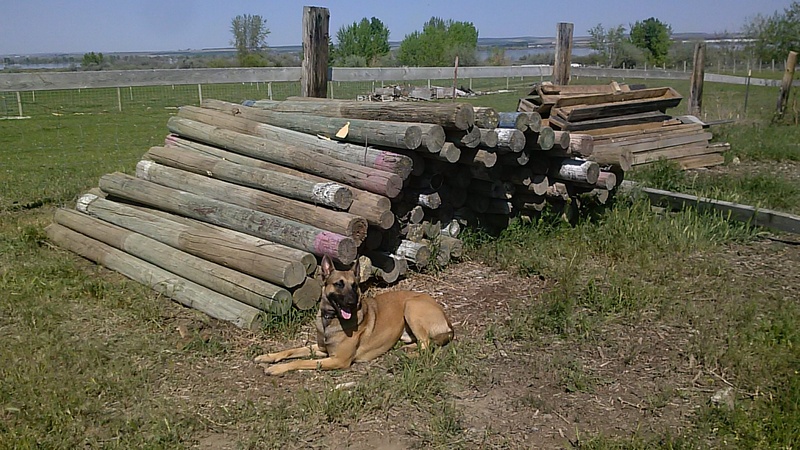 The end pieces, 5-ft sections of 2×6 lumber that Himself had lying around, were nailed to the poles. Then we laid the next layer, nailing it to 2×6 in its turn. My design called for three sections of rebar – two at each end on the outside and one in the middle inside – that essentially brace the poles into place, which minimizes the load on the end pieces. I think this would make them more stable and better suited to being sat on while one is weeding, so will build the remaining beds that way. Some of the poles are bent, creating gaps when they were laid on top of each other, so in a few places we’ve had to block the gaps inside with some old chipboard from one of Himself’s piles of Random Stuff That I May Need One Day. This will probably rot within a year or two, but by then the soil will have stabilized such that it’ll remain in place. So far this year, I have planted a second plum tree, a peach tree, about 80 asparagus, a rhubarb plant, about 15 strawberries, a gooseberry bush, a horseradish, and about 10 walking onions. I have more berry bushes, another rhubarb plant and some fingerling potatoes waiting to go into the ground. I should have started seedlings in pots weeks ago, but am behind the curve … After last year’s weedy debacle, part of me couldn’t quite believe we’d be able to get our act together this year. But Himself has quit pouring contumely upon my commitment to organic gardening, and I’ve quit being rigid and perfectionist about it, and we’re managing to cooperate … so I guess this week will see me hard at work with seed packets and potting soil. In the fullness of time, maybe there will be crops! He also sent me this link in case I should feel the need to “perform my own calculations”. You’ve just got to love such optimism! I have calculated how much dirt/manure mix we have available in the pile in the front yard. The pile is between 5-1/2 to 6 ft tall and the radius of the pile at the base is a bit more than 6-1/2 ft. 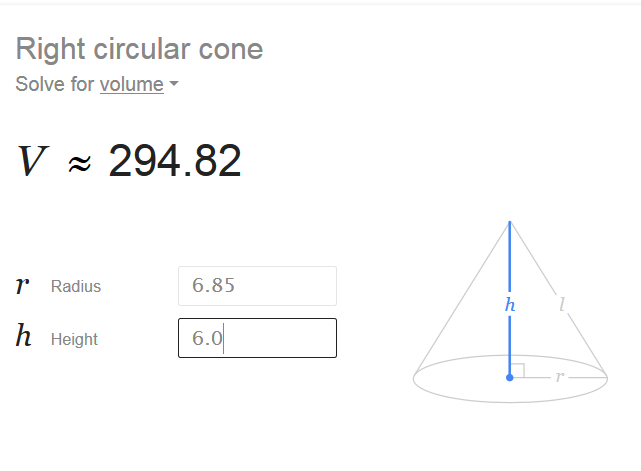 This calculates out to a pile volume of something between 270-to-295 cubic feet of soil/manure mix. 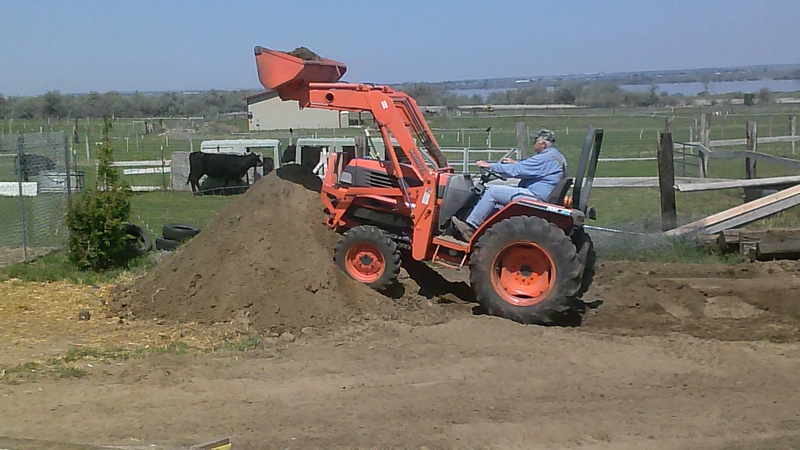 Therefore, there is ample soil/manure in the pile to support filling at least FOUR MORE 14 ft beds. I am now doubly motivated to build and fill the remaining beds, just to see if he’s right! Your turn! How does spring affect your behavior? If you’re a gardener, do you try to befriend Mother Nature, or do you believe in better living through chemicals? Have you ever felt the urge to hit someone with a set square if something you build doesn’t line up perfectly? Oh my word, I wish I were fitter! And at least 100 lbs thinner! And that my feet didn’t hurt so when I stand on them for any length of time! And that this STUPID pain behind my left knee would STOP! All that grumpiness and bitching apart, I am happy to record that today I Put Seeds Into The Ground! First, I dumped two wheelbarrow loads of composted horse poop, chicken poop and vegetable matter into one of the raised beds. (I have weeded all six of the raised beds – go me!) I hope the compost is rotted enough … I’d have preferred to have given it a couple more months of actual proper care (as opposed to just standing around looking messy), but that would have meant buying compost, which goes against the grain. I shall just hope for the best. I forked it in as well as I could, mixing it with the soil already in the bed. And then I sowed a row of beets, two rows of radishes, a row of broccoli and two rows of Walla Walla sweets. All seeds, and I’m realizing that next year I must get started very much earlier with indoor planting, but I have hopes that some of them will come up and do their vegetable thang. The first raised bed, weed-free, full of compost, and planted. All that’s required now is faith. And regular watering. So far I have also weeded and leveled a little more than half the long bed along the Nasty Neighbor’s boundary. Once that’s done I will dig in plenty of compost and then transplant the asparagus from the raised bed they’re in … We actually got a small crop the other day and it was most delicious! I don’t think I have as many asparagus as I’ve allowed room for, so am thinking I may try to scrounge plants off the non-gardening types who bought a neighbor’s house. Otherwise I’ll just leave space – or rather, fill it up with nasturtiums – and we can go out into the fields and dig up asparagus plants come fall. At any rate it’ll be ready for a good crop by next year. I already have a bunch of tomato plants, some bought by Himself and some given by our friend Fae. They’ll be ready to go into the NN Boundary bed pretty soon, in front of the asparagus. I need to go downtown for nasturtium, marigold and alyssum seed … got borage with the veggie seeds from Territorial Seed Co, near Portland. The compost pile is coming along, no thanks to the chickens, who like to stomp on it and kick it all over the place. I need to put down some railroad ties or similar to form a barricade … I don’t mind them stirring it up, but I want it to stay in one place! I have LOADS of compost in the containers we built out of wood pallets last year. I thought it hadn’t broken down well but, having found some of it to be very usable, I am hoping there’s more good stuff there than I’d expected, despite my neglect. Anyway, I’m putting the undecayed lumps into the new pile, mixing them in with barrow-loads of horse manure interspersed with the green weeds I’m digging up. I am a little disappointed at my failure to do the permaculture thing properly. I haven’t been able to handle the soil without tilling it – too many weeds that have been allowed to grow too large, and the soil is rutted and hillocky so it just has to be leveled, and in any case it’s pretty compacted and in need of compost. Also I am irritated beyond belief that Himself is out there scraping and compacting – and raising DUST to transform my contact lenses into sandpaper – with that bloody tractor. But better to make a start, however imperfect, than lose yet another year. I will make much more effort to mulch and lay down cardboard toward the end of the year, to be sure it’s good to go early next spring. For now, I’m just glad Himself has given up being cross about my insistence on organic gardening, and is willing to give it a try rather than stomping off and starting his own patch somewhere else. At least he agreed not to till with the tractor. So all good, I guess! So long as some of these seeds just sprout!